Add holiday cheer to any tree with intricately reverse hand painted Ne’Qwa Art ornaments that are crafted using the same tools and techniques artisans have practiced for centuries. 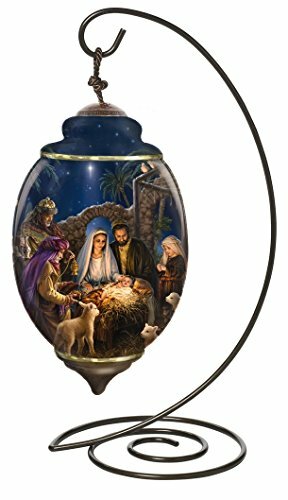 Each ornament is meticulously hand painted through a centuries-old art form in which the image is skillfully composed in reverse from inside mouth-blown glass. An impressive work of art, it comes nestled in a 6.25 H x 6.25 x 8.25 D inch satin and velour gift box with a Certificate of Authenticity. An adjustable tasseled cord allows for flexibility in presentation from a Christmas tree or decorative stand. 7.5 inches high, Standard Trillion shape. COMES WITH A HANGING STAND. 7.5 inches high. Standard Trillion shape. COMES WITH A HANGING STAND.